How many Slap Chop with Free Bonus Graty sets would you like? Slap Chop™ is a manual chopper machine that chops food when you slap the plunger. You can slap once or twice for large cuts or several times for finer cuts. You don't have to switch any blades. Today we're offering the Slap Chop™ for just $19.95 USD and $6.95 USD shipping and handling, and the Graty for cheese for FREE, just pay an additional $6.95 USD to cover the shipping and handling fee! 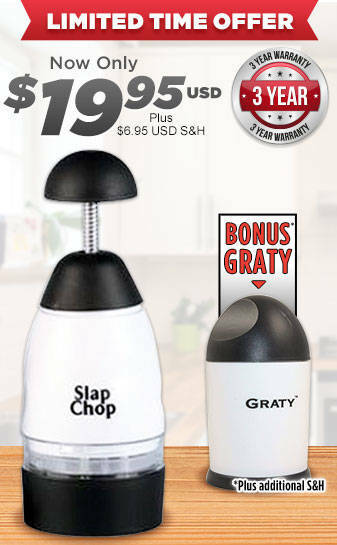 Both the Slap Chop™ and the Graty for cheese comes with a limited 3 year warranty.